Some mushrooms hunters call the ever-growing desire for morels "morel madness" or "morel fever." 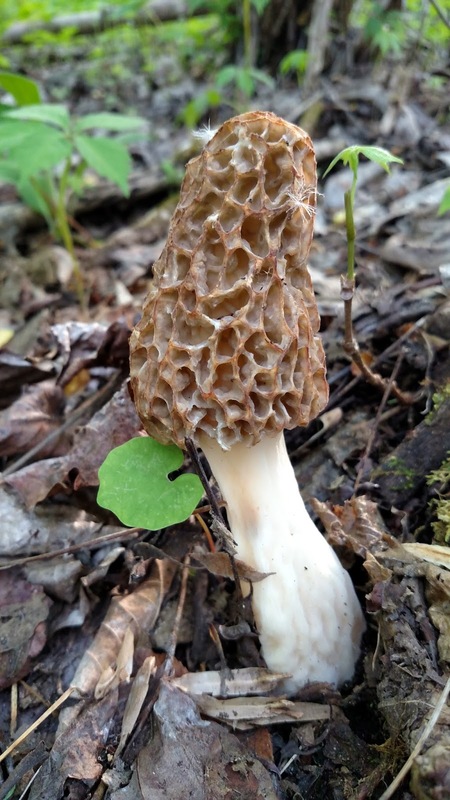 I think it would be more accurate to title what I experienced as "morel envy." 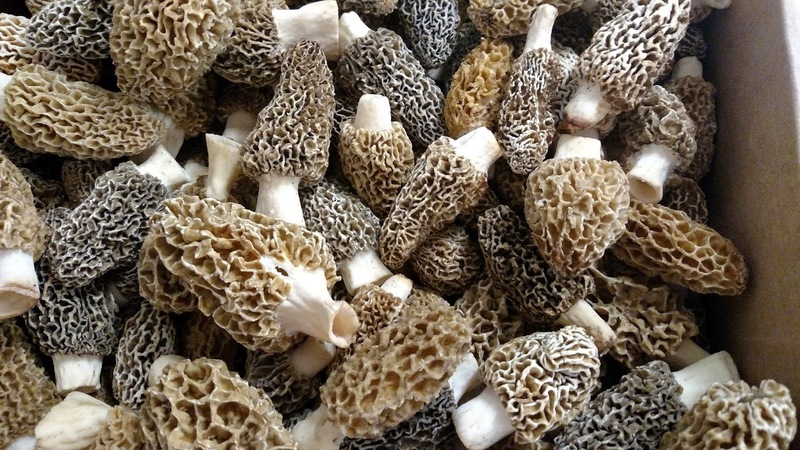 It all started with a delivery of fiddle head ferns, ramps, and hop shoots at the restaurant...along with eight pounds of morels from a supplier in southeast Pennsylvania. Eight pounds of morels...sadly not for me. I've found morels before, but that was a few years ago. This year, inspired (or extremely jealous) by the bounty I saw at work, I decided to make a more concentrated effort. Matt, my brother-in-law, suggested I try a recently opened area of game lands that contains an old, overgrown apple orchard. Unfortunately, when I arrived at the game lands I found the trees in the orchard had been torn up and put through a chipper by the game commission, then the stumps burned. Poking about, I didn't see any sign of mushrooms or any sort of growth at all. There were some hedgerows full of ferns and nettles on the perimeter, but they were mushroom-less. I tried different areas of the game lands for two days last week, then tried a new area this week. On a hilly, shaded area above a creek, I finally had some luck. I found four mushrooms that day...five if you count the one a deer mashed into the ground. Still, I was happy to have those four, and they were delicious sauteed over a grass-fed rib eye. Carla and I were both amazed by the intensely earthly, savory, and slightly smokey taste of the morels. The next day I returned to the same area and began to work my way farther up the hill into the deeper shrub. This was where I found my largest morel, along with another ten smaller mushrooms. Although comparatively a small haul, Carla and I felt rich with mushrooms when we got home and wanted to celebrate. 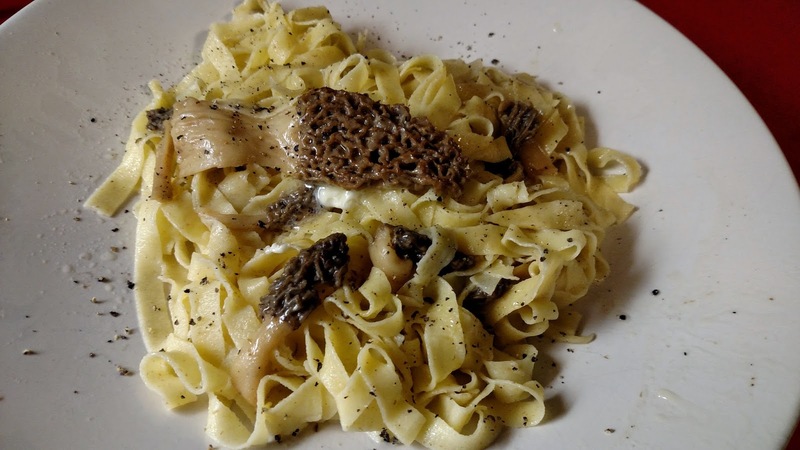 We decided to enjoy the morels with brown butter and fresh pasta. 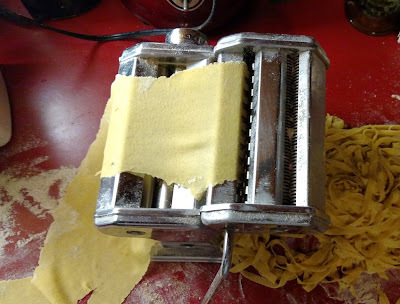 I started a batch of pasta dough, then left it to rest while I plucked all the burrs off my clothes and dog. Fried up in brown butter, the morels filled the house with a woodsy aroma. The mushrooms were delicious with the pasta, while the infused butter spread the morel flavor across the noodles. Again, as the night before, Carla and I were amazed by the taste of these mushrooms. 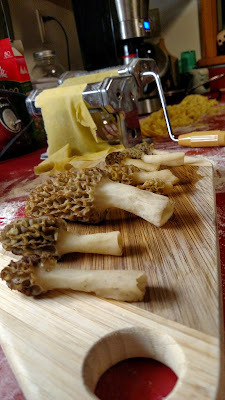 Even compared to the times we've purchased morels, these were by far the best. Part of the exceptional nature may have been from the fact that we had earned them by crawling along the damp leaves and prickly briars. 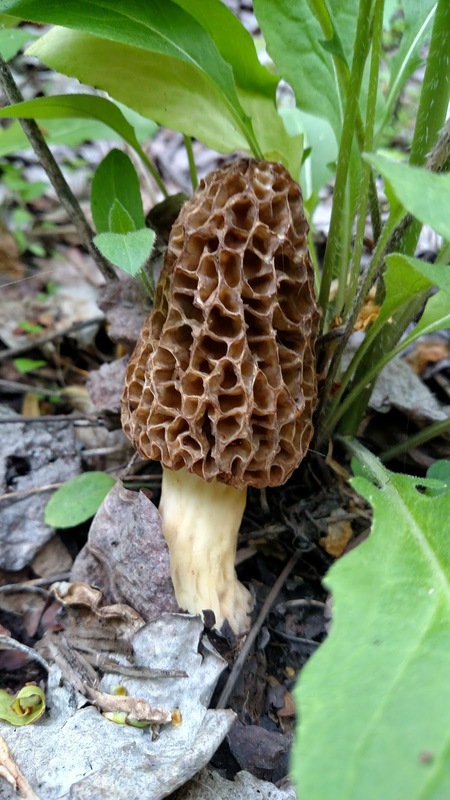 On the other hand, I think a big part of the morels' flavor was due to how quickly we went from harvesting them to eating them that evening. Much like freshly-cut asparagus or a tomato still warm from the sun, these morels were at their peak and full of wild woodland flavor and enjoyed before any of their flavor could fade.